Over the Christmas holidays, we'll definitely be hitting our favourite all-you-can-eat sushi restaurant...maybe more than once! But the leisurely days of vacation also offer up time for experimenting in the kitchen. It's a good opportunity to make your own sushi rolls (maki) if you've never done it before, or even if you have. If you're new to sushi making, it seems more complicated than it is. Once you get the hang of it, it's an easy and convenient process. Make a little sushi for a snack or a lot for dinner, and get the family involved. 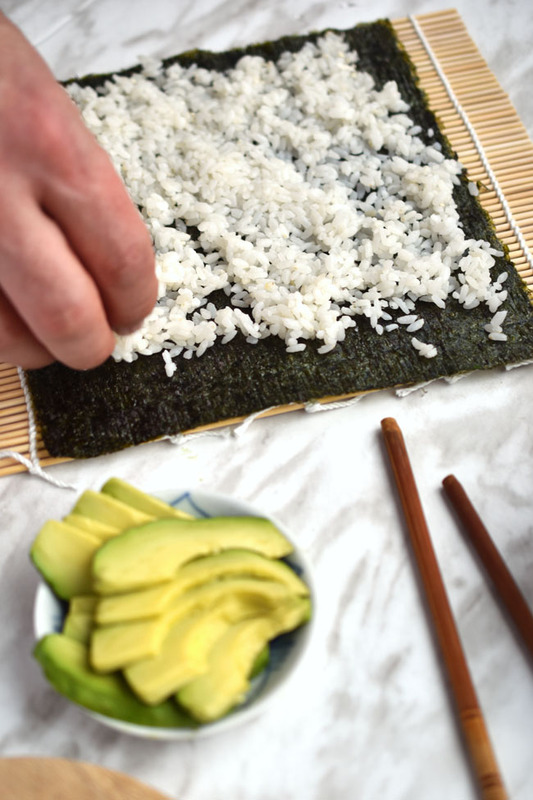 Kids can layer the toppings on the seaweed and try their hand at rolling the sushi. 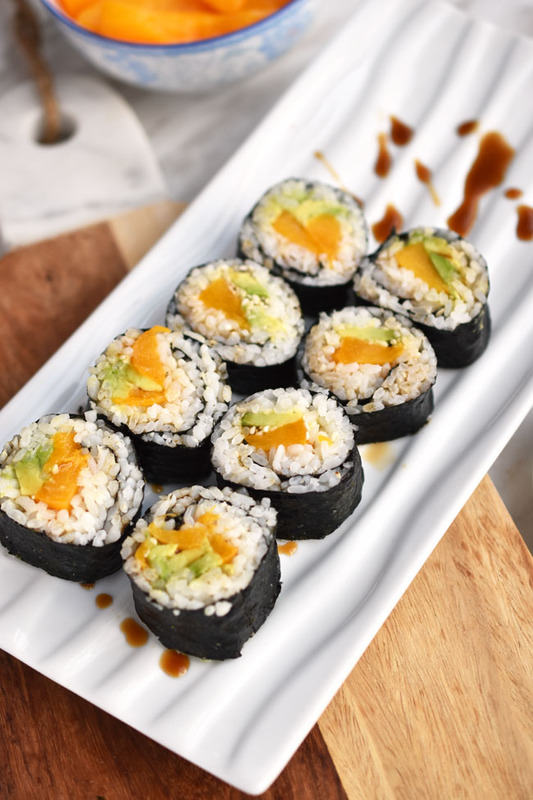 Our latest family favourite homemade sushi rolls are these Peach Avocado Sushi Rolls With Teriyaki Sauce. They are simple to make and have a fresh taste that combines sweet and savoury elements. 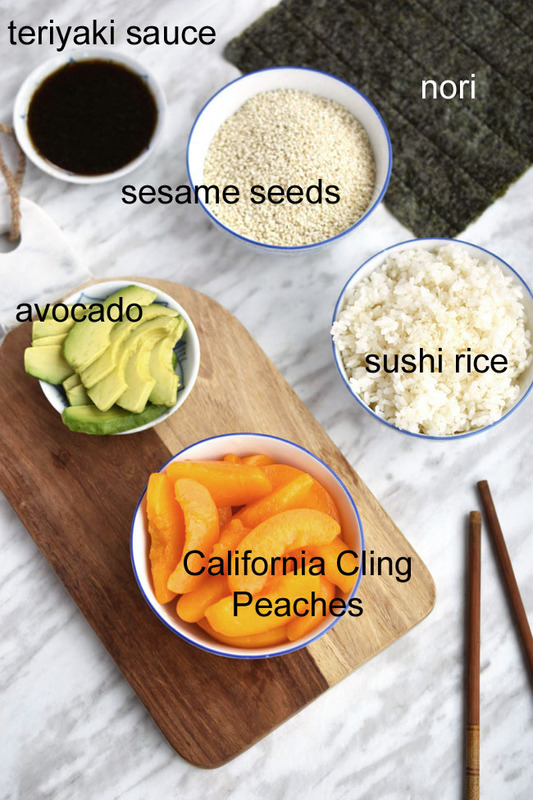 These sushi rolls call for a few simple ingredients - cooked sushi rice (or sticky rice), nori (seaweed), avocado slices, sesame seeds (optional), teriyaki sauce and California cling peaches. Canned peaches make this recipe super convenient. I buy the canned peaches that are already sliced and then slice them more thinly. The peach centre of these sushi rolls is moist and sweet. It's a similar effect to mango, but much easier to accomplish (no peeling needed and no pit to get around). To make the process even easier, cook your sushi rice earlier in the day. Once it's cooked, lay the rice out in a glass baking dish and mix in rice vinegar and salt. If you are planning to use it right away, turn the rice over with a spatula until it cools. Put a sheet of seaweed on a rolling mat. Keep a small bowl of warm water beside you. Dip your hands in the warm water, pick up some rice and press it onto the seaweed sheet. Start the rice at the edge of the seaweed closest to you and stop with about an inch of seaweed to spare to give space for sealing the edges. 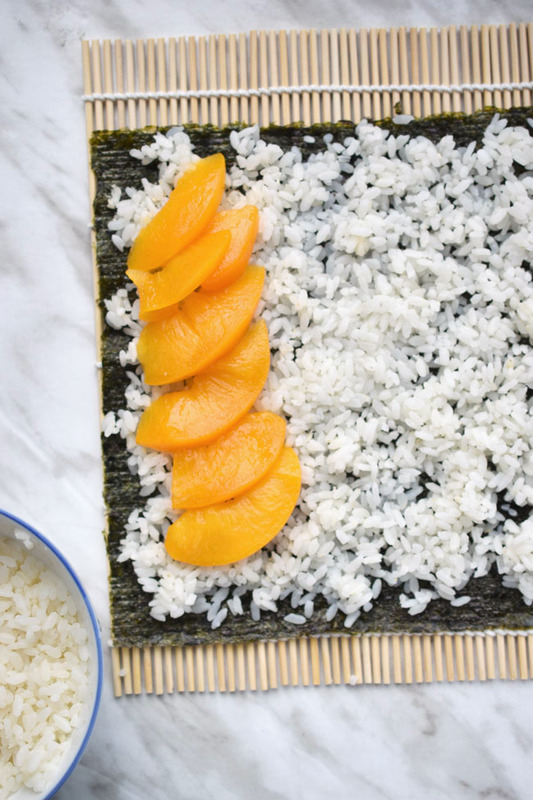 Put a row of thinly sliced California cling peaches along the bottom third of the sheet of nori. 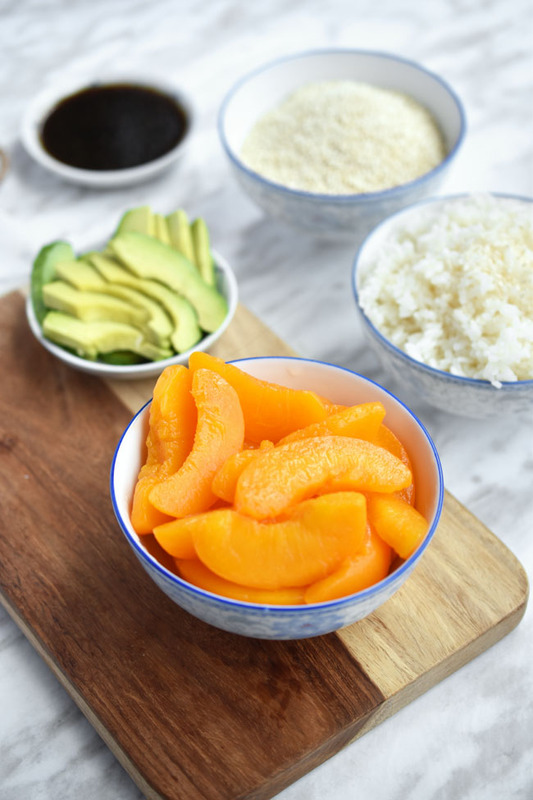 Add a row of avocado slices, overlapping the peaches, and sprinkle on sesame seeds (if desired). 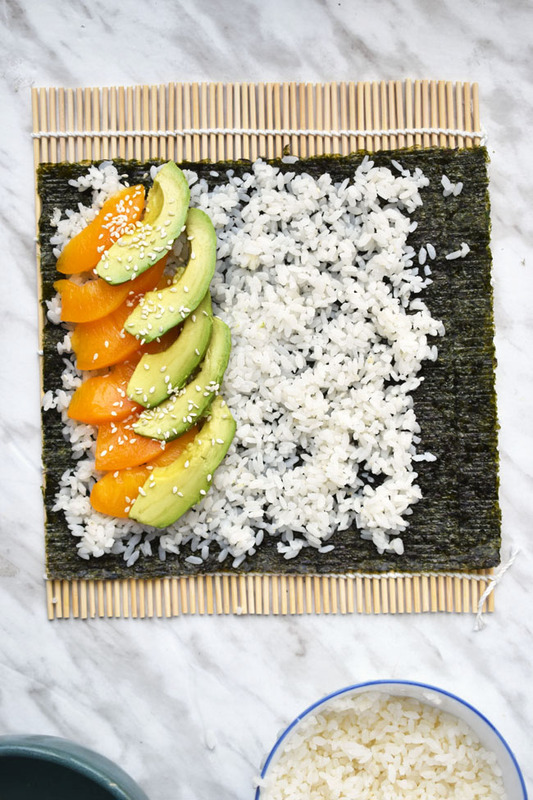 Begin rolling up the mat from the edge closest to you, stopping to tuck the seaweed around the peach and avocado after the first three-quarter roll. Continue to roll to the end. Wet the end of the seaweed with your fingers and seal the roll together. With a sharp knife, carefully slice the "log" into about six sushi rolls. Drizzle on teriyaki sauce when serving. 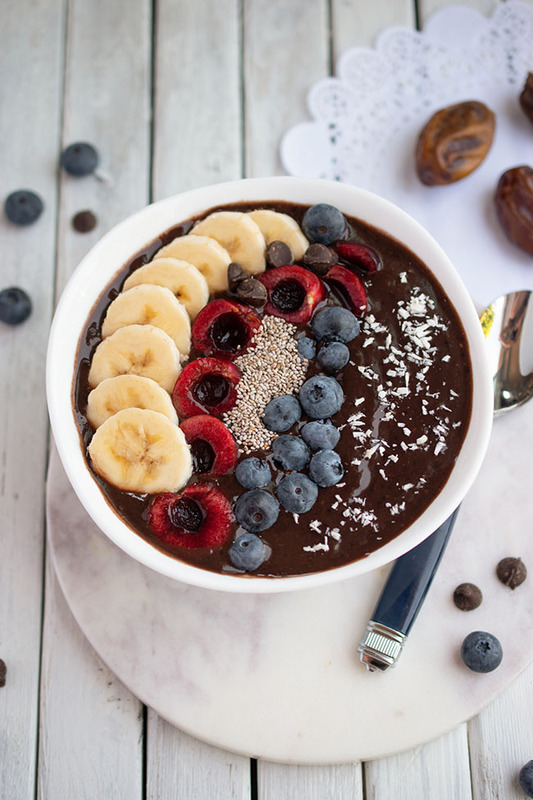 You can use a store-bought teriyaki sauce for this recipe or make your own with my quick recipe, which offers a healthier alternative thanks to coconut sugar, fresh ginger and soy seasoning. I tend to make a thin teriyaki sauce, but you can also add a slurry of water and cornstarch while cooking to make a thicker sauce. 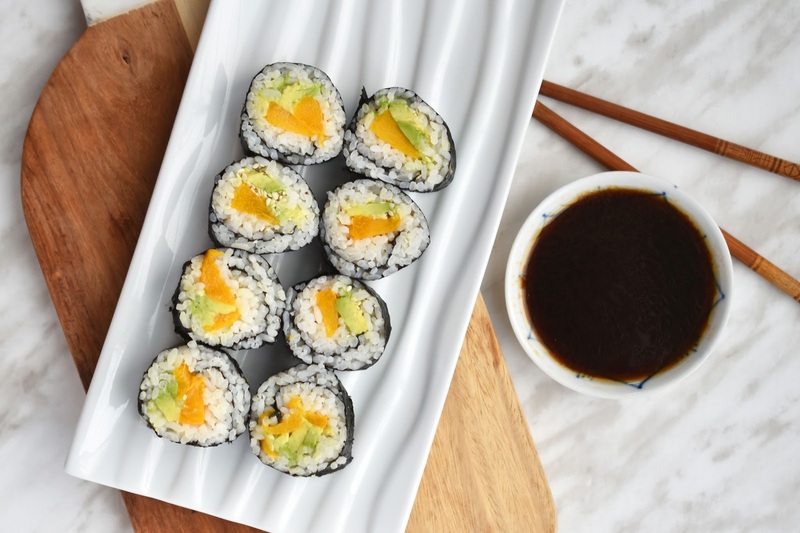 These Peach Avocado Sushi Rolls taste light and fresh. The drizzle of teriyaki sauce adds a nice saltiness, for a delicious sweet and savoury contrast. My family really enjoys these rolls. The only thing is, there's never enough! The recipe makes about 24 rolls, but we need to double it for dinner. Keep some canned peaches in your pantry along with your sushi fixings, and you'll be able to make these sushi rolls at a moment's notice. 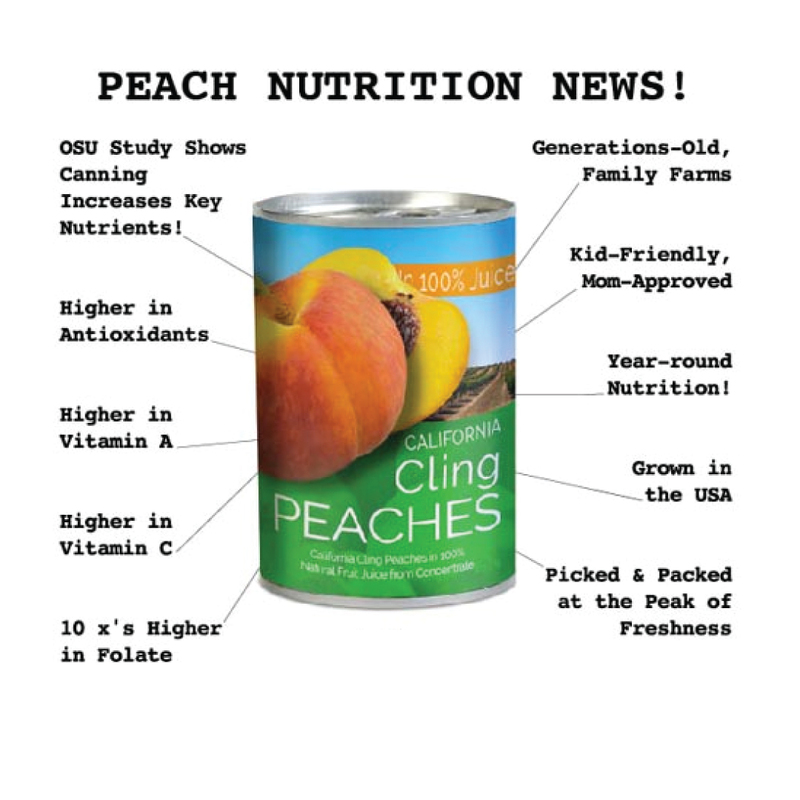 Did you know canned peaches are as healthy as fresh-picked peaches? Even more so. 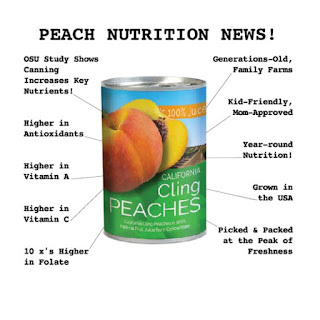 California cling peaches are picked and packed in their own juices, usually within 24 hours, so they retain their appearance, texture, flavour and nutritional content. 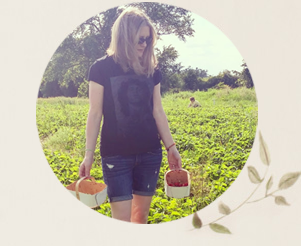 And the canning process has been proven to increase key nutrients like Vitamin A, Vitamin C and folate. 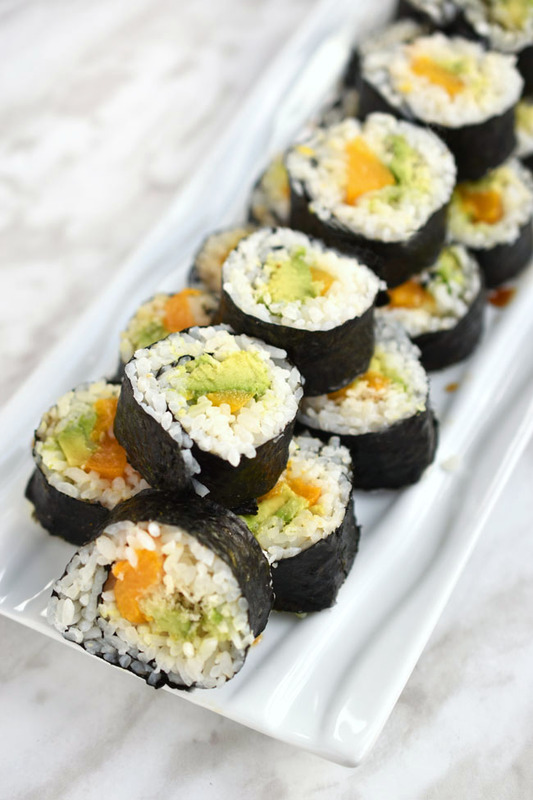 In other words, feel free to gorge on these light and tasty Peach Avocado Sushi Rolls without guilt. Unlike when I go for all-you-can-eat sushi at lunchtime and feel so full that I can't even have dinner that night! 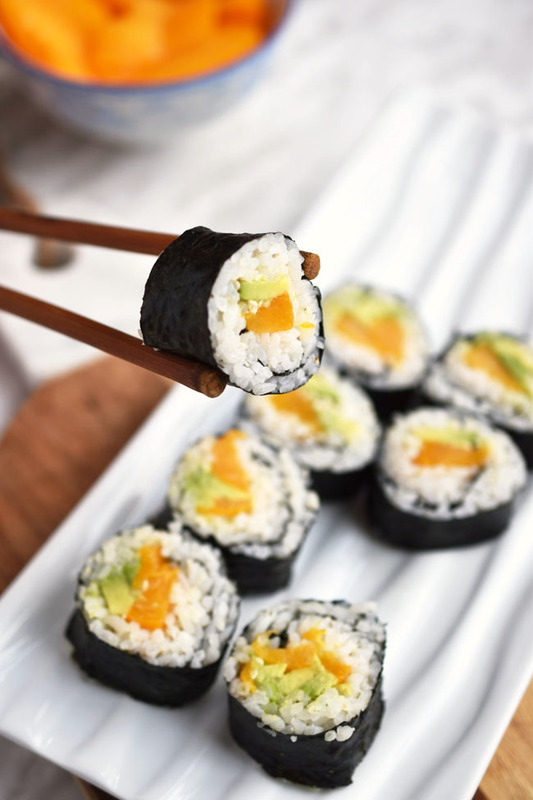 Do you make your own sushi rolls? Would you like to try? Do your holiday plans include sushi? Cook rice according to package directions. Pour cooked rice into a long glass baking dish. Drizzle on rice vinegar and sprinkle on salt. Stir rice using a spatula. Continue turning over rice until it cools. Prepare teriyaki sauce as rice cooks or while rice cools. Lay 1 sheet of seaweed on a sushi mat. 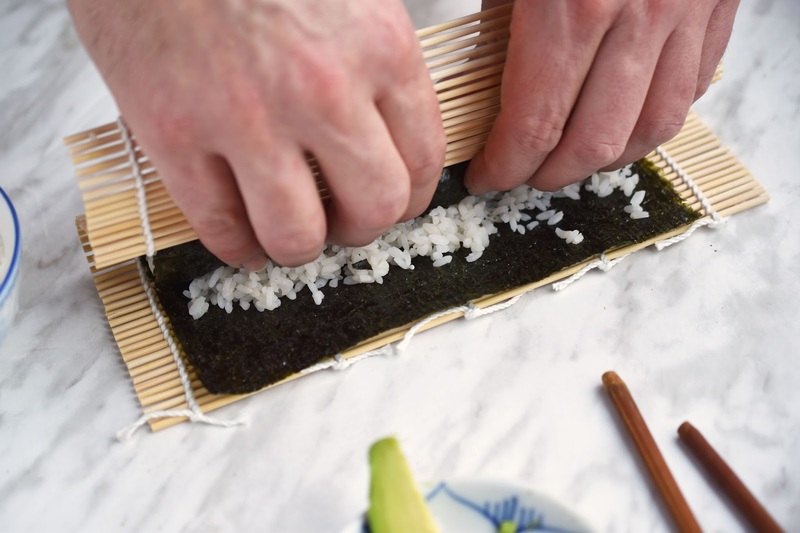 Wetting your hands in a dish of warm water, begin to press a thin layer of rice onto the seaweed, starting at the edge nearest you and stopping 1 inch from the far edge. Place a line of peach strips across the bottom third of the seaweed sheet. Do the same with the avocado. Sprinkle on sesame seeds if desired. Begin rolling the seaweed up using the rolling mat. After the first three-quarter turn, use your fingers and the edge of the mat to tuck the sushi fillings in tightly. Continue rolling to the end. Use your fingers to smooth some water onto the far edge and seal your roll together. Cut into sushi rolls using a sharp knife. Repeat until fillings are used up. In a small pot, heat oil gently on medium. Add ginger and garlic and saute for a minute or so. Add remaining ingredients. Stir regularly for a couple of minutes. Turn the heat to low and cook for another 5 minutes, stirring often. Remove from heat. Remove garlic and ginger. Cool. 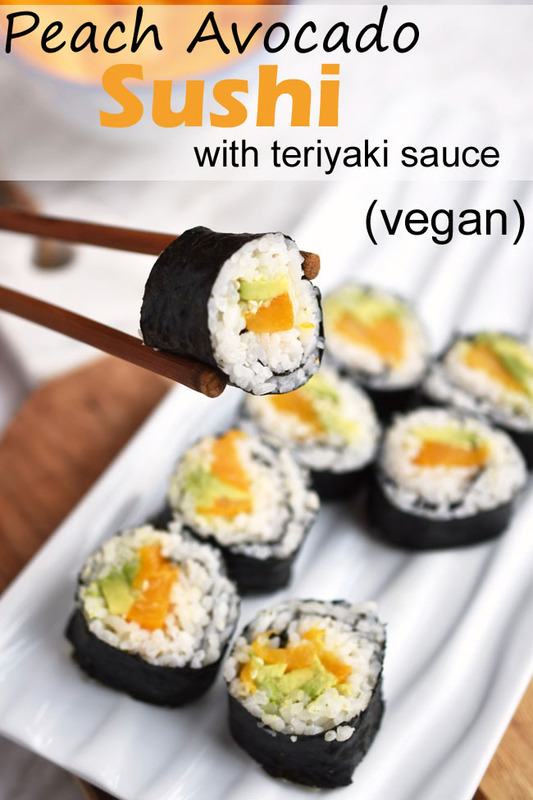 Drizzle teriyaki sauce lightly over sushi rolls when serving.